Confil Grout - Pourable grout for horizontal applications. 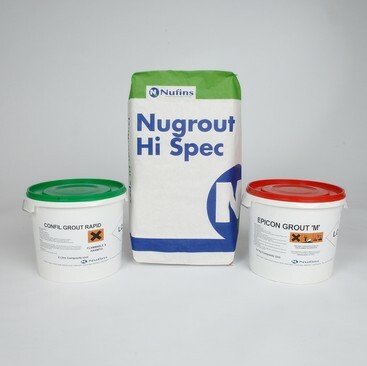 Confil HP Grout - Thixotropic grout for use with a mastic gun in vertical and inverted applications. Quick curing combined with rapid bond strength gain. Available in a standard and rapid set versions, for winter or cold temperature applications. Quick, easily mixed and applied. High compressive, tensile and flexural strengths. Excellent bond strength to steel and concrete. Economical - quantities mixed as required. Excellent water and chemical resistance. Resistant to vibration and impact. To download the Confil Grout Technical Data Sheet click here. To download the Confil Grout Safety Data Sheet click here.